Is it that hard to choose the best epilator for you? No, it isn’t. What you need to be looking for in an epilator and then I will offer some epilators suggestions. How Much Does an Epilator Cost? 1. How expensive must an epilator be in order to remove hair from the root as it should? You’re going to discover that even a $30 epilator can be an amazing hair removal product. 2. Small tips to guide you in choosing the best epilator for you. These are tips related to how many tweezers an epilator can have, the type of accessories that are worth considering, and a quick reminder about exfoliation because that’s the only way you can prevent and get rid of ingrown hairs. 3. My 4 suggestions for you to discover some of the best epilators for your body. 4. How I ended up using an epilator. What convinced me to use an epilator in the detriment of waxing or shaving. Since we live in the real world, the subject of money is always involved when buying something we need. Epilators are not incredibly expensive devices, especially when you consider that it’s an investment that will last for at least a couple of years. It’s not like in the case of waxing or depilatory creams where you have to buy them over and over again. That’s one of the main features that I truly appreciate. It’s great that they offer to every woman the possibility of removing hair from the root without investing too much money in the process. A $30 budget can get you a basic corded one, while a more substantial budget (around $100) can offer you the possibility of enjoying a number of accessories, as well as the ability to pluck hairs as short as 0.5mm. Even a $30 epilator can remove hair efficiently. Fancier ones, like those that can be used under the shower or those coming with more caps (for example facial or sensitive caps), those indeed are more expensive, up to the price of $100. They are worth it if you want the extra options. Now that you are clear that even the most expensive epilators are still not expensive, let’s see what are the main features that distinguish these hair removal devices. 1. Tweezers are the main focus since they are the ones removing the hairs. Less expensive devices have 20 tweezers or so. It means that the epilation process will take a little longer. The highest number is 72 tweezers, belonging to the Emjoi AP-18. The most expensive epilator that is featured in this article has 40 tweezers, which judging by the fact that another model features 72 of them, might not seem that great and might not justify the high price at the first view. That model is one of the fastest hair removing tools and one of the best epilators. I’m talking about Braun Silk-Epil 7681 and the Braun Silk Epil 9 epilators. Another myth that I also believed in, is that the larger the number of tweezers the more intense the pain is. That proved to be wrong and I’m glad it did since that means that we don’t have to feel more pain for getting rid of our hairs faster. 2. An efficiency cap is the basic accessory. But things have been taken further and accessories like sensitive area cap or facial cap have been added. So that means that you don’t have to spend extra money on getting a separate facial epilator. 3. There are even more accessories, like trimmer and shaver heads. Suddenly, the epilator becomes your shaver, for those areas where the pain is too intense. These accessories are very much appreciated by many women and I can easily understand why. An accessory that I wouldn’t recommend using before epilation is the cooling glove. That tightens the pores. If you want to use the cooling glove, it’s better after the hairs have been removed. The type of glove that I would certainly recommend using is the exfoliating glove. It doesn’t come as an accessory to any epilator, except for the Philips Satin Soft Hp6520. The cost is way low and it’s a great method for dealing with ingrown hair. 4. There are two speeds for most epilators. There are only a few left with one speed. 5. A built-in light is not something that you find on all epilators. But it can be very useful. Medium-priced and expensive epilators usually have one incorporated. 6. There are two main categories: corded (the cord is long for every model so it won’t be a bother) and cordless (that need to be charged for an hour and run for 40 minutes on average). Epilators are not incredibly popular, a fact that surprises me a great deal. I’m biased, I know. For those of you who want to change their epilator or who want to buy one for the first time, let’s see which are some of the best epilators at the moment. Why choose the Philips HP6401? There are three words that best describe it: incredibly affordable and qualitative. It’s the perfect example of a basic and simple epilator that removes hairs efficiently! In order to do that, it has 21 tweezers, which means that the epilation might take a while so patience is essential. But it’s an understandable compromise for the price. 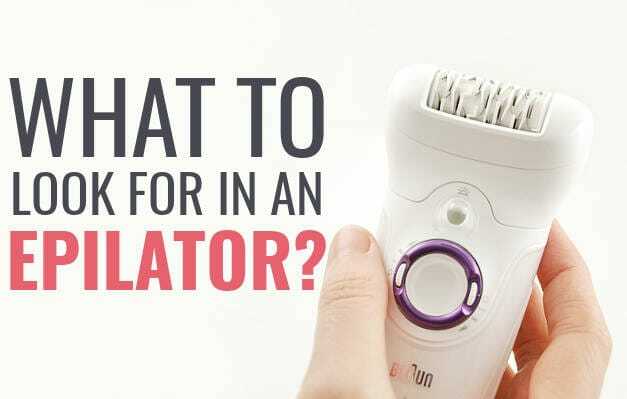 There are downsides but things should get better in time and it may be true for two things: the time it takes to remove hairs by the root with an epilator and for the pain you feel during the sessions. The efficiency cap is a very good accessory that should make the pain feel less intense. At least that’s how I feel it when I’m using an epilator with an efficiency cap. It’s a corded device but the long cable will offer you plenty of freedom. Everything is highly satisfying about the Philips HP6401, including the 2 speeds and the 2 year warranty. The fact that I have no big cons to mention about the HP6401 means that it’s worthy of its title as one of the best epilators for an affordable price! It’s my recommendation for women who want to keep the price as low as it gets and the quality at a high level. One aspect that would make you look at more expensive epilators would be the fact that the HP6401 doesn’t have built-in light. Read the full review on Philips HP6401 Satinelle. Why choose the Emjoi AP-18? The main reason is that it has 72 tweezers thanks to its dual opposed heads. Epilation should go down so much quicker. There’s also the Glide technology or the middle lifting gingers that lift up the hairs, helping in removing tiny hairs, as short as 0.5mm. This device is full of surprises, another one being the Silver Ion technology for antimicrobial protection. Another advantage is that it can be used for removing facial hair as well, besides hands, legs, underarms, and the bikini line. It’s a very powerful epilator and that’s why it’s corded. If you want less power the 2 speeds offer enough freedom. The only thing I would mention as a con is the absence of a built-in light. The Panasonic ES-ED90-P is just one of those deals that seems just too good to be true. At least when you get it on sale for an amazing price. Then, indeed, it’s just an amazing wet and dry epilator at a phenomenal price! For women who want to have their hairs removed from the root using foam or shower gel, the ES-ED90-P might become their best epilator. Being wet and dry, the first obvious conclusion is that it’s cordless. It takes an hour to be completely charged and then you can make use of it for about 30 minutes. That’s one of its main disadvantages: the 30 minutes running time won’t be enough for most women. A second charge will be need for sure if you want to epilate your legs, underarms, arms, and bikini area. The design is the most girlish one there is. It’s simply adorable. The advantages don’t stop there. There are two accessories that drew my attention instantly: the wide dual-disc epilator head and the gentle epilation head. The wide dual-disc head has 48 tweezers so the epilation process can be a fast one, it’s great for legs and arms. You can also add the gentle cap for those sensitive areas. On the other hand, the gentle head is a lot narrower, with a lot fewer tweezers, and it’s mainly intended to be used for the bikini area and the underarms, although it’s going to take longer. It also has 2 speeds, I recommend the first one especially for sensitive areas. There’s the built-in light to make it a complete hair removal device. Besides these two caps, there are two heads included in the package: shaver and trimmer heads. There’s also a pedicure buffer for removing dry, callous skin. It means that it’s a 3-in-1 system and it covers all needs. The package is completed by a travel pouch and a cleaning brush..
That price surely fits in a lot and you can read more about it in my full Panasonic ES-ED90-P review. Why choose the Braun Silk- Epil 7? If you want a wet and dry epilator that does a wonderful job at removing hairs as short as 0.5mm in both environments, then you might consider this device! A less expensive alternative, very much similar and maybe a little less painful, is the Panasonic ES-WD51-P. The 40 tweezers might not sound impressive but they are phenomenal! Firstly, the Braun Silk Epil 7 Xpressive is amazingly fast and secondly, the close grip tweezers should not leave any hairs behind. Another feature that justifies the price is the big number of accessories, 5 to be more specific: shaver and trimmer caps if you want to take a break from removing hairs from the root, plus facial cap, efficiency cap, and sensitive area cap, which is also called the underarm cap. It’s another example of a 3-in-1 system and it can be used to remove hair from the entire body. Being wet and dry, it’s a cordless device that takes one hour charging time and up to 40 minutes of continuous usage and the hygiene is simply handled by washing it. Braun Silk Epil 7681 also features built-in light and speed personalization so nothing is missing from this epilator. Not even the pivoting head was left behind, making it easier to get all the hairs removed from difficult places, like knees or elbows. The Braun 7681 is as close to perfect as you can get and much more expensive than the rest due to its many accessories, high built-in quality, and incredible ability of transforming hair removal into a fast and efficient activity. But what’s the true downside for this great epilator from the wet and dry category? It’s simple: it is a bit expensive. But even so it’s an amazing epilator, worthy of its price. I’ve been using epilators for about 8 years and I love them. At the moment, I am using the Braun Silk Epil 9561. Maybe it was the fact that I tolerate pain quite well, as long as I know that the end result is simply amazing (like when you decide to go to the dentist because you want a healthy sparkling smile). Or maybe it was the fact that I wanted to cut back on the money spent on waxing at beauty salons. Or the fact that I’ve reached the point where I was tired of disposable razors. I believe that all the above reasons put together led to me to having a very long relationship with these tiny devices with many little tweezers. So, now can you tell which one is the best epilator for you? Thanks soo soo much for this article. Perfect info for my needs!! Thank you very much for the comment and for reading my article! Hi, I am having a hard time in choosing an epilator. I am stuck between the braun 5/5280 and 7/7681 epilators. It’d be great if you could help me choose one. If you can afford it, choose directly Braun 7681. The 5280 is a precursor of the 7 series so obviously the 7681 is an improved version. That’s why I think it’s best to get directly this one. Order it online so you can return it if you don’t like it. HI Denisa, I’m thinking to purchase an epilator for first time. I am confused which epilator would be the best for me. I want an epilator that can remove hairs from my arms, legs, underarms and pubic area. I have never shaved or waxed my pubic area, I just trim that…… ☺. I can’t purchase Braun Se 7681 because it’s a bit costly for me but I like it’s all features. NOW the Question is, Which epilator would you recommend that can remove hairs from my whole body and come under 38 to 39 US dollar??? Your budget is really low and there are not many epilators that you can get with your budget. You can either get Braun 3170 or Philips 6401. It’s a basic epilator but you can use it remove hair from the entire body so that’s good. However, I would suggest that you go to a waxing salon for your first pubic area hair removal. It might easier to epilate if your area is already accustomed to the pain. Anyway, when you get your epilator start with your legs because those hurt the least. Then the arms, the underarms, and the pubic area. The underarms will offer you an idea of how it’s going to feel. Also, don’t forget to exfoliate. Let me know if you need any more help Ankita. Thank you denisa for your advice. I think I should raise my budget because Philip 6401 and Braun 3107 have only 21 tweezers…. and as I read less tweezers are more painful so I would go for the better one. Now ☺ which one you would recommend??? Less tweezers aren’t necessarily more painful. The main disadvantage is that epilation takes longer than it would take when using an epilator with more tweezers. If you were to raise your budget a little, I would suggest Emjoi AP-18 if you can find it. A second option would be a model from the Braun Silk Epil 5 series because the epilators from this series are medium-priced and they have 40 tweezers. There are many models but their availability differs from country to country so it would be best to check out what models you might be able to find in our country. Hi denisa, thank you again…..? ?.i like all your suggestions and i love your blog . Finally, Braun silk epil 5280 is available here. Is that good??? Yes Ankita. Braun 5280 is really good. I think you should order it online just so you can return it if you don’t like. I’ve always wondered…how painful is it to use the epilator? I don’t know anyone who uses one, so I have no way of testing one out without having to buy one. Well, I don’t know exactly how to describe the pain. If you have a tweezer in the house grab it and start removing hairs from your legs really fast. It’s kind of like that but multiplied a few times because the tweezers on an epilator rotate really fast and there are many of them. It’s not an excruciating pain but it still is painful. Some women can get used to it but some give up. If you order the epilator online, you can return it in case you don’t like it. If you have waxed until getting an epilator it’s going to be easier. If you have been shaving it’s going to be more painful. Thank you for such a nice article, it’s a great help for beginners like me. Is there any Epilator that satisfies my needs? Please let me know. If it helps in suggesting, I bought Braun 3170 and returned it as it had only 20 tweezers and took quite long. If it had more tweezers, it would have been a perfect model for me (even though it should always be plugged in). Thank you so much. Hope you’ll come up with something I like ? You can also check out the Emjoi eRase e60. It has 60 tweezers, it has a cap that’s good for facial hair removal, good price but no light and it’s corded. hi , it’s my first time that I want to buy an epilator and I like the Philips HP6522 but I need some advice ,please help me do you think it’s good or not?? If not what’s your suggestion? Philips HP6522 is a good epilator. It should be priced as an affordable epilator, the equivalent of $50-$60. I don’t know exactly from where you’re going to buy it but I saw that the price varies a lot for this epilator. I would recommend checking out the Braun Silk Epil 5280 or the Braun 5329. I think these two are better than the Philips 6522. Hi, I just discovered epilators and I really want to purchase one. I am used to using a razor but I want to try something else as I am prone to razor bumps and ingrown hairs (I have coarse hair). I have never waxed but am not to keen on the idea. I did try tweezers on all my areas and am comfortable with the pain. I would prefer something good for legs and armpits and possibly my pubic area. I am pretty open on price but would prefer to spend under $100. I was looking at the Braun Silk-epil 9579 and Emjoi AP-18. Would you recommend one over the other for me or something else entirely??? Thank you! Since you have selected two of the best epilators at the moment, I cannot recommend something else entirely. However, I can tell you that I think you should choose the Emjoi AP-18. It has an amazing price, it’s powerful, fast, and perfect for the areas you want to epilate. It’s the best choice for you, from my point of view. Good luck, Kris! I have never waxed my legs but have shaved it a number of times. I had once tried an epilator on my legs, but it didn’t remove the hairs from root. I now am in a dilemma whether to buy an epilator or not. And also money is a problem for me. Is there any epilator below $14 which also will do its work efficiently? Unfortunately, I have not heard of an epilator under $14. You need around $20-$30 to get an epilator. I recommend the Philips 6401 or the Braun Silk-Epil 3170. If you get an epilator, you just need to remember to move the epilator slowly and to keep it steady against the skin, in the opposite direction in which the hair is growin. Epilation requires patience, it’s not as fast as shaving. It’s going to take at least an hour to epilate your legs properly. Hi there. Great blog! So helpful! Which one would you recommend for less pain and getting as short hair as possible? These are my two issues. I would recommend the Panasonic ES-ED90. Usually, really short hairs get caught by the tweezers with a bit more difficulty that’s why you might need several passes on those areas. I am going to try epilTors for the first time and am a lil concerned about the pain..looking at ur review I feel the fastest one with 72 tweezers sounds good to me…but I also found Phillips satinelle advanced wet and dry.. Wat are ur views on it.. Prices of both are same but I couldn’t find the number of tweezers it had…or if u hv any better option please suggest it to me..thanks! I foubd about the Philips Satinelle Advanced that it has 32 catching points and 17 discs. I think that means that it has 32 tweezers, I think. Anyway, it’s a pretty small epilator and I think it would take longer to epilate than it would with the Emjoi AP-18. All in all, I’m still not confident about recommending the Satinelle Advanced. The Emjoi Ap 18 is going to seem painful in the beginning but it’s fast and powerful. The disadvantage about it is that it doesn’t any caps, which makes it a bit more appropriate for women who have a pretty long prior experience with epilators. I think you should check out the Philips bre210. Or the Panasonic ES-ED90-P.
Let me know if you cannot find either. Hi my hair is pretty thick, can you suggest a epilator that is painless, cost is not an issue. I just want it to be less painful. Unfortunately, epilation is painful. A slightly more gentle epilator is the Panasonic ES-ED90-P. But it’s still far from painless. My advice is that if you are afraid of the pain and you are pretty convinced that you can’t handle it, you shouldn’t try an epilator. I am interested in buying an epilator that I can use on legs, arms, and face. My bigger concern being face, I think. Price is not necessarily an issue. Which would you recommend? I would recommend the Panasonic ES-ED90-P. It’s a bit more gentle and it has all the accessories you need. If you don’t like the Panasonic or you cannot find it, there’s the Braun 9579. It has a facial cap and it’s good for the whole body, as well. Let me know if you don’t like either, Jelaine. Please suggest an epilator that best suits my needs. Money is not an issue as it will be a long-term investment but I want a good epilator that I can stick with and that can help me in cleaning the pubic area mainly. I really want to remove hair down there but with lesser pain than Braun silk epil 1. I am hoping that the new and advanced series are less painful and more comfortable. Can you please confirm if thats the case? Are newer models less painful than older versions? If yes, then how less painful will they be compared to Braun silk epil 1? I am confused between the Braun epil 7 and 9 series. Please help me in deciding among these or suggest any other epilators that you think would be suitable for me. Regarding the intimate area, I think it would be best to go to a beauty salon first. Just for one session. It can make things a lot easier because you can start epilating just as soon as the hairs start growing a bit and maintain the area hair-free by epilating more often in the beginning, like once a week. The newer series are definitely just as painful, maybe even a bit more painful because they’re a lot more powerful. The good news is that it gets over more quickly. From all the models, I think you should get the Panasonic ES-ED90-P. It has all the accessories you need. It also has a trimmer and I definitely recommend using it to shorten the hairs if they are too long. It’s a lot more painful to epilate long hairs. In the sensitive areas, like the underarms, bikini area, and face you should use the epilator on speed 1. Aimy, don’t forget to always moisturize after each epilation. Thank you Denisa for your prompt reply. Can you tell me why you didn’t suggest the Braun silk epil series? Doesn’t braun silk epil 9 have sensitive area cap? Also please tell what is an efficiency cap? I cant find Panasonic ES-ED90-P in my country. My main concern is pubic hair. Facial hair etc is not so important and is manageable in other ways. The Silk Epil 9 doesn’t have a sensitive area cap and, compared to the Panasonic epilator, it’s a bit more painful.That’s why I was hoping you can find the Panasonic ES-ED90-P. Since your main concern is pubic hair, I think your next option is the Braun 7681. It has all the accessories needed but I must warn you that some users have reported battery malfunctions after about a year of use. It’s just a tiny risk that you should consider before buying this model. There is another corded model that has a sensitive area cap. It’s the Braun 5780. The efficiency cap lets the tweezers get really close to the skin, almost as if there was no cap attached to the tweezers, which also makes epilation a bit more painful than a massage rollers cap. It’s generally used on the lower legs. Cant the battery be changed if it malfunctions? I cant find Braun 7681. But I can get Braun 7569, is this good? what is the difference between this and 7681? If I keep 9961, wont I be able to use it for pubic hair? how bad it will hurt as compared to 7 series? If I trim first then use high frequency massage cap when using Braun 9961, will I be able to do sensitive areas? It can be used for the bikini area and the underarms but it doesn’t have a sensitive area cap and it doesn’t even a facial cap. You should return it and get the Braun 7569. It’s just like the 7681 but it also comes with a cleansing brush for face. Don’t use the cleansing brush if you suffer from breakouts or if you have recently had any zits. I’m sorry you have to go through all this trouble, Aimy! It does have a facial cap. Can the facial cap be used for intimate areas instead of sensitive area cap? I am trying to return it. Hopefully will be able to do it. Thank you so much Denisa. You are really nice and helpful! You can use the facial cap, Aimy. It’s going to take longer than when using a sensitive area cap but, at least, if you cannot return it, you have the option of using the facial cap. Thank you for this website. It has been super helpful. I am researching for my very first epilator. I am looking specifically for the bikini area. Is there one that is easy to handle around nooks and cranies. **Great with sensitive areas** and course hair? The Panasonic ES-ED90-P would be a great choice. It has a gentle cap for the bikini area and it’s a great epilator overall. You second choice would be the Braun 7681 or the 7561, whichever you can find. Let me know if you have any problems finding them. Thank you Denisa 🙂 I will look for both of those! Is there a big difference between Panasonic ES-ED70-G and the ES-ED90-P? Amanda, there’s not a big difference between the two. They both have the same number of tweezers and almost the same accessories, including the gentle cap for the bikini area. If you find the Panasonic ES-ED70-G you should get it. I’m looking for the epilator for my arms and legs. I use to have Panasonic ES-ED 90 and I didn’t like that batary is dying fast doesn’t let me finish both legs and arms and I can’t using this during the charging, also, it always grabs my skin on elbows, leave in growing hairs on my lower legs and I never use “wet option” . But I really like that this epilator has LED lite, very gental and pick up small hairs. It has large surface and pivoting head. I will really appreciate if you can suggest me good epilator without useless function and good quality. Thank you! I think you should go for a corded epilator. I think you’re already used to the pain so you should check out the Emjoi e60. It’s lacking in a built-in light but I think you can manage even so. You’re still going to get ingrown hairs so you need to start exfoliating. You should get either a scrub or make one at home or get a pair of exfoliating gloves. It’s good too exfoliate daily at the end of you usual shower. Regarding the elbows, you need to bend the arm so that the skin is stretched properly. If you epilate while holding your hand straight it’s going to be caught by the tweezers every time. Your budget is pretty high. You could get the Braun 7561, it’s on amazon.in at a pretty price right now and it has a sensitive area cap for the pubic area. There’s also the Braun 9561 but it doesn’t have a sensitive area cap for the intimate area. The only problem with these two epilators is that they are cordless so there’s a risk that in the future the battery might malfunction and it won’t hold a charge anymore. That’s the risk with these epilators. Otherwise, they totally fit your needs. What about emoji soft caress and erase e60…do they have sensitive area cap?….because i dont want to invest on shaver or trimmer head….moreover i need a corded one…cant v use the braun 7561 and 9561 while plugged in?? Souganthika, the Emjoi e60 would actually be perfect because it also has a sensitive area cap, lots of tweezers, and it’s corded. You cannot use either of the Braun epilators while plugged in. I have a problem of ingrown hairs so please suggest me perfect epilator for me. Firstly, you should focus on your ingrown hairs because an epilator will more likely make the matter worse. It would be best to find a solution for your ingrown hairs before starting to epilate. I am not aware which hair removal method you’re currently using. If you want an epilator for the body I recommend the Emjoi AP-18. It’s very powerful, an amazing epilator overall. Regarding the ingrown hairs, you need to exfoliate. You should try a body scrub, use it on dry skin before a shower and then on wet skin if your ingrown hairs are pretty serious. You could also try a chemical exfoliator, like the Tend skin solution. Good luck, Anshi!